In September, a mysterious, tiny Pokemon began appearing at random around the world in Pokemon Go. With a jelly-like body and a nut for a head, it was unlike anything we’ve seen before in the game, or even in the entire Pokemon universe. The creature was soon revealed to be Meltan, a completely new Mythical Pokemon. With this announcement, we also learned that Pokemon Go would somehow be connected to encountering Meltan in the upcoming Switch games Pokemon: Let’s Go, Pikachu and Let’s Go, Eevee. Now, we know more details about how the games are connected, and how we’ll go about capturing Meltan in the mobile game. As we told you previously, players will be able to transfer Pokemon from Pokemon Go into Let’s Go, Pikachu and Eevee, allowing users to add them to their team in the Switch game. Typically, when players transfer a creature from Pokemon Go, they’ll receive some kind of reward in the mobile game, like Pokemon Candy for the critter they just transferred away. However, the very first time Pokemon Go players make one of these transfers, they’ll receive an extra special reward instead: a Mystery Box. We don’t know what the Mystery Box will contain (after all, it’s a “mystery,”), but we do know this: Once players open the Mystery Box in Pokemon Go, Meltan will begin appearing in their game, and can be captured like any other creature. 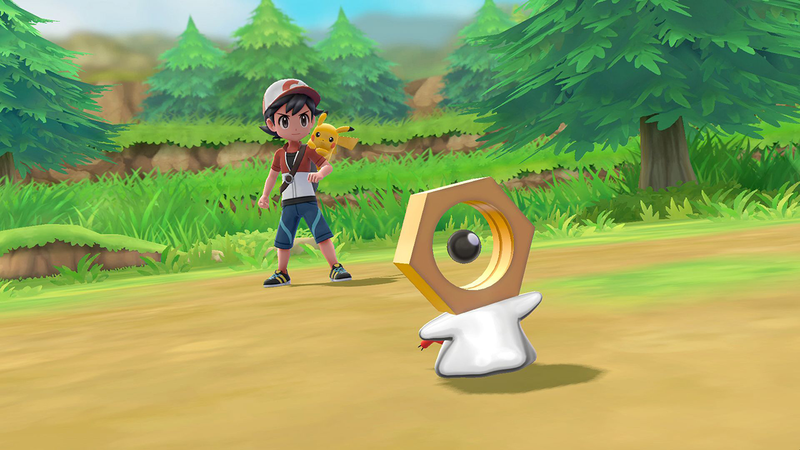 Once Pokemon Go players capture Meltan, they’ll have the option to transfer it into Let’s Go, Pikachu or Eevee, if they want to add this special Mythical creature to their team. This is pretty exciting for users who were already planning on picking up Let’s Go, Pikachu or Eevee, but what if you weren't? Does this mean you’ll never be able to capture Meltan in Pokemon Go? Thankfully, no. If you have a friend or family member who owns one of the Switch games, you can connect your Pokemon Go account to their game to transfer a Pokemon and receive a Mystery Box of your own. What’s more, once you open the Mystery Box, it will close, but that’s not the end of it. It can be opened again after a certain amount of time has passed, but you’ll need to transfer another Pokemon into one of the Switch games in order to open it again. Finally, Pokemon Go players will be able to help Professor Willow will his research into Meltan by completing a new set of Special Research tasks that will be released this winter. Special Research tasks are story-based, and ask players to complete a series of challenges at their leisure in order to receive (typically) great rewards. For instance, the two sets of Special Research tasks that have been released so far allow players to capture the Mythical Pokemon Mew and Celebi. Since Let’s Go, Pikachu and Eevee will be released on November 16, we’re guessing these tasks will launch at around the same time. Keep checking back with us, as we’ll be sure to let you know when these tasks are added to the game, and what they ask you to do. To learn more about Pokemon: Let’s Go, Pikachu and Let’s Go, Eevee, check out our guide. Brandy Berthelson has been writing about video games and technology since 2006, with her work appearing on sites including AOL Games, Digital Spy, and Adweek’s Social Pro Daily. When she’s not gaming, Brandy enjoys crafting, baking, and traveling with her husband.